Retro is hot and already back for quite a while. Wearing clothes and accessoires from ‘way way back’……..right! Vintage. Digging everything from the 80’s and early 90’s. 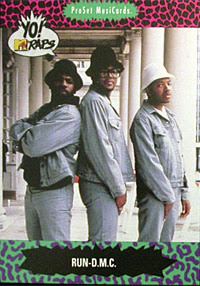 Yes, talking about look-a-likes of old heroes as Run DMC, DJ Jazzy Jeff & the Fresh Prince, LL Cool J, Chuck. D, Grandmaster Flash, Beastie Boys, Ice-T, Eazy-E, Big Daddy Kane and De La Soul. New in this retro trend is having a retro Kids Club. Coming together, all being inspired by early 80’s old school rap. Most wellknown at this moment are the Retro Kids from where else then New York. With articles in the New York Times, commercials from Puma, fashion shows in Paris and Londen and a article in the Dutch Blend Magazine (please take a subscription if you don’t have one) they are trying to role over the world. In Holland we have our own (Retro) Club Kids, from art directer and stylist Joey Elgersma, check out his inspiring website and portfolio. Just for the Dutch ladies and guys who love this kind of Retro Stuff, check out RetroRush.